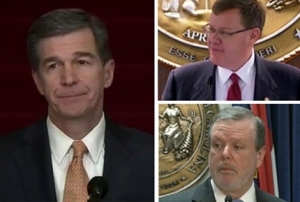 Legislative leaders announced Thursday that they were dismissing their federal lawsuit against Gov. Roy Cooper because he didn’t follow through on “threats” to expand Medicaid. Senate President Pro Tem Phil Berger said they were told by the federal Centers for Medicare and Medicaid Services that the Governor had not followed through on attempting to expand Medicaid. “We are pleased Gov. Cooper abandoned his plan to defy state and federal law and unilaterally expand Obamacare in North Carolina, but remain prepared to take swift legal action if he tries to make this unlawful move again,” Berger said in a joint statement with House Speaker Tim Moore. The 20-page lawsuit was filed in January. I hope all of North Carolina citizens vote the elitists out. If politicians did not get so many perks we would have honest politicians; they should have had no insider trading and be paid the same as teachers, fire fighters, social workers and other professionals who put their dedication and love to helping all of our NC and United States citizens. We are keepers of our brothers/ citizens first. If this was done we could afford to care for our sick and disabled. I thiink politicians would like to send our mentally ill to gas chambers; since they know they can’t get away with that, they have voted to just let them starve to death on our streets. Our wars have been for politicians financial gain. It is a war crime what Bush, Cheney, and cohorts did to our young men who fought for false wars to make billions for themselves and ploitical cohorts. Look what politicians have done to poor Veterans. NC Politicians should have been intelligent and honest enough to stand up and vote against war criminals. I also have to wonder why NC teachers are robbed every time a governor wants to spent more money for cohorts ( like McCrory did for Duke Energy) and lower taxes for the rich. Treatment of teachers in NC will.cause teachers who study at our fine universities to go to other states. I am sick of paying a higher percentage of taxes than the wealthy. I started out supporting Trump, then Hillary when I should have voted for Sanders. I hope he runs again. I don’t care if he is 100 years old – he gets my support.